Some people have no sense of humor; others lack an eye for double standards; and the cops in New Zealand are just plain square. 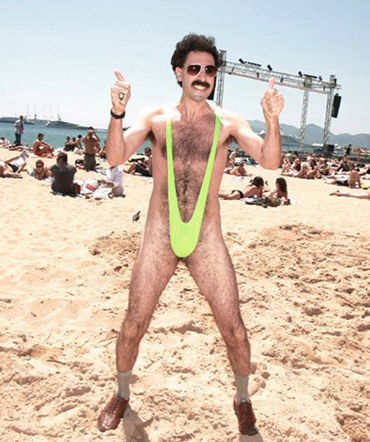 Rugby fans are officially banned from wearing skimpy bathing suits, a la Borat, to a rugby tournament, Courier Mail reported. The alleged idea here is to protect innocent children from having to ball-gaze whilst trying to take in a hearty round of rugby. But no one seems to mind it when chicks play eye candy for dudes. Where's the equality here? The world rugby Sevens event in Wellington last year attracted several dozen men unafraid to flaunt their family jewels in the infamous, bright onesies. But an officer said last week on television, "It's a family event and there will be children there." He also asked fans to demonstrate "a sense of decency". Anyone showing up in said threads will not be permitted entry. Lame. I wonder if they're close to banning low-cut tops and bikinis.